Houston-based Lionstone Investments, on behalf of a group of institutional investors, has acquired the San Diego Tech Center office campus in Sorrento Mesa. While the terms of the transaction or transactions were not disclosed, the combined price of the nine-building, 655,643-square-foot complex and its adjacent land is reported to be upwards of $250 million. The seller, a unit of Beacon Capital Partners had paid $152.5 million for the complex and its 38 acres in April 2012. There is sufficient land for an additional 1.2 million square feet of new office and/or industrial development. Monroe was formerly half of the Cruzan|Monroe duo, who along with Cigna (NYSE: CI) acquired the DiamondView Tower office and retail complex overlooking Petco Park for $121 million in 2012. 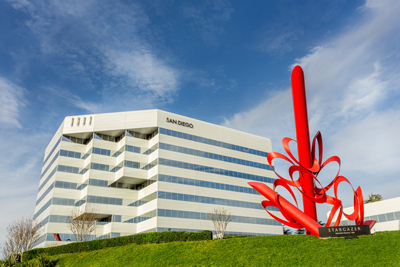 The San Diego Tech Center campus, with its signature metal red sculpture out front, was constructed in the mid-1980s by developer Jack Naiman, who also developed the Aventine office and hotel complex in University City. The San Diego Tech Center includes an eight-story office building and eight one- and two-story R&D buildings. It is home to a Karl Strauss Brewery restaurant, as well as a fitness facility, Pilates studio and locker room, lap pool, basketball and volleyball courts -- all of which are set among a fully-landscaped Japanese garden in its seven-acre park. The campus is 99 percent leased to investment grade companies including Sony Computer Entertainment America, Qualcomm Inc., Novatel Wireless, Combined Conditional Access and Samsung. Beacon Capital had invested $6.3 million in capital upgrades that garnered a LEED Gold certification, as well as renovations to the gym, restaurant space, as well as landscaping and signage improvements. “The San Diego Tech Center was way ahead of its time and has been the most visionary and successful technology campus in the county since its construction in the mid-1980s,” Monroe said, adding that the property's 7-acre park is a another feature that makes it unique. The San Diego Tech Center is also adjacent to Qualcomm Inc. (NYSE: QCOM), which occupies more than 4.6 million square feet in the immediate area. “The campus is ideally positioned in one of Southern California’s most sought-after corporate hubs, and has exceptional ease of access to the [Interstates] 5 and 805 freeways," added Jane Page, Lionstone Investments’ CEO in a statement. While dollar amounts are still being calculated, Monroe said significant capital upgrades are planned throughout the existing campus. Plans for future development have not been announced, but will likely focus on attracting build-to-suits or phased development on other parcels over time. Eastdil Secured and JLL (NYSE: JLL)represented both buyer and seller in the transaction. Jay Alexander, Chad Urie and Tim Olson with JLL will continue to manage leasing efforts for the campus. Founded in 2001, Lionstone Investments is a privately-owned real estate investment firm specializing in researching, conceptualizing and executing national investment strategies on behalf of institutional investors and high net worth individuals. San Diego-based Locale Advisors is a real estate investment firm that specializes in acquisitions of value-add and redevelopment projects with particular emphasis on office, creative, technology and collaborative work spaces throughout Southern California. Locale was founded in 2014 by Monroe, who over the course of his 13-year career has acquired or helped facilitate the acquisition of more than $2 billion worth of commercial properties. When Beacon Capital acquired the San Diego Tech Center in 2012, it was bought from The Charter Hall Office REIT, a Sydney, Australia-based firm that owned an 80 percent stake. MGP Office Trust, a unit of Maguire Properties, sold the remaining 20 percent to Beacon. The complex had been purchased by a Maguire Properties (NYSE: MPG) entity for $185 million in April 2005 before the L.A. REIT began divesting its interests here and elsewhere. The San Diego Tech Center was previously owned by a Rreef Management-controlled entity that paid $130 million for the property in 2001.